DC-10 lays down a long line of retardant to help fire fighters hold the back fire. Yesterday afternoon, to the relief of many down in Santa Barbara who feared the fire had escaped containment lines, fire fighters pulled off one of the finest back fire operations ever performed. 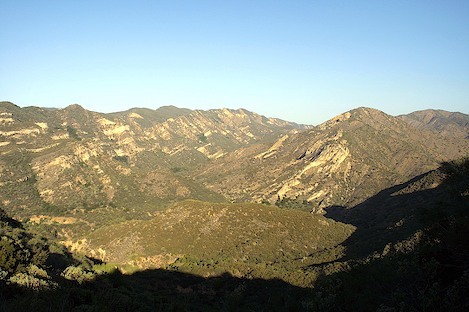 With the fire pressing up Agua Caliente and Diablo Canyons, and a small slopover into the Matilija Wilderness causing a momentary fear they’d lost Monte Arido Ridge and continued movement of the fire in the Mono Creek area, command decided it was time to implement “Plan A” – and burn out ahead of the advancing flames. The back firing began just after noon. 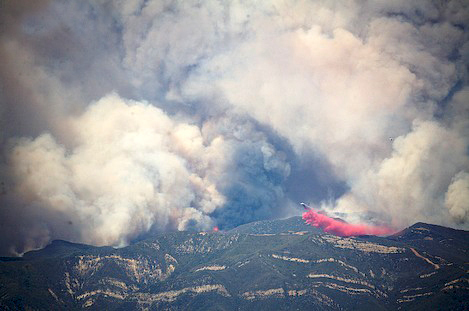 Not too long after that the fast-rising plumes of brown smoke topped with what looked like mounds of pure white began to appear over the Santa Ynez Mountain crest behind Montecito. From town it was difficult to believe reports the fire was miles beyond the crest, yet from the top of Cold Springs Canyon it was clear the back firing operation was at least three air miles northeast of the city and clearly not a danger to Santa Barbara. 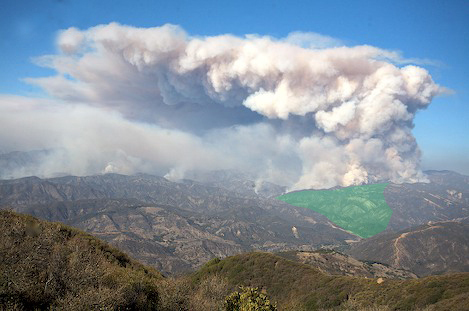 Light green shading shows the approximate area that will be part of the back fire operations today. 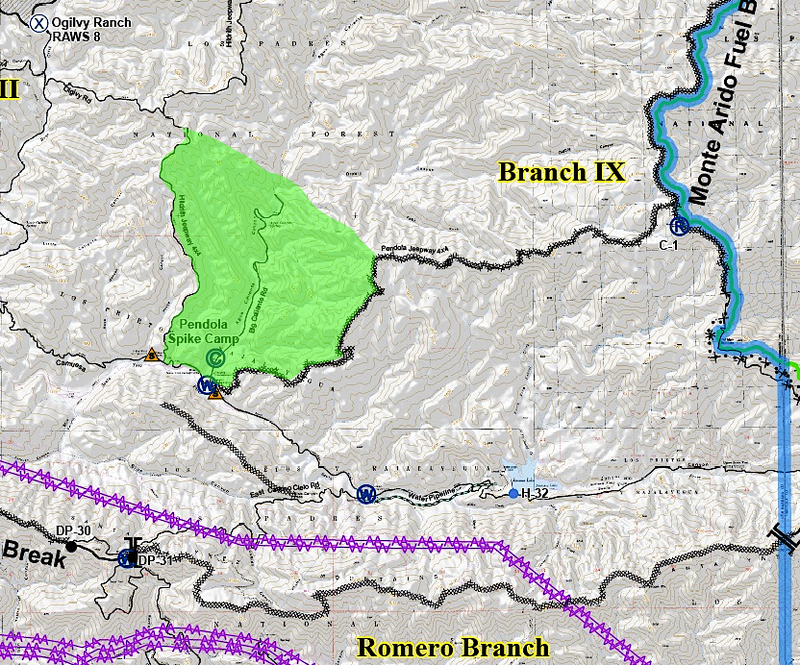 At the lower point the fire will be within a few hundred yards of the Santa Ynez River. At the morning briefing at Live Oak Camp, operations leaders confirmed that they would continue the back firing and hope to bring the fire down the lower four miles of Pendola Jeepway to the mouth of Agua Caliente Canyon. “We’ve still got a lot of hard work down there,” Forest Service Liaison Brad Joost told those assembled at the briefing. “When we bring the fire down to Pendola Station, this will be the closest point we’ll be to Santa Barbara. “The difference, however, is that we are now in control of the fire,” Joost added. Shading depicts a rough outline of the area to be burned today. When this last part of the operation is completed successfully, Santa Barbara will be out of harm's way. What could make the operation difficult is that the jeepway takes a “dogleg” to the left a little over halfway down to Pendola Station. If not today, tomorrow may bring the welcome news that South Coast residents are finally safe. Almost unnoticed because of the intense activity in the Pendola area, the fire has escaped through the containment line down Sweetwater Trail. Before back firing could take the Zaca Fire down into Sweetwater Canyon, the wildfire came up the canyon and moved west over the unfinished lines protecting Sweetwater ridge. Several days ago, the Richardson Zone leaders had requested, and received, permission to build 2.1 miles of dozer line into the San Rafael Wilderness to anchor the top of a seven mile long ridge line down to the Sisquoc River and then uphill to the White Ledge area in an attempt to check the fire. A week and a half ago the fire had moved over the top of Mission Pine Basin and entrenched itself in the upper Sisquoc near Big Pine Creek. 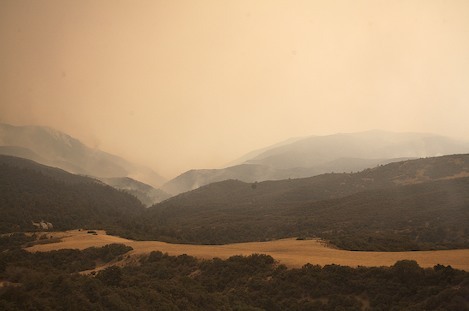 Steadily, the fire has moved north towards the Sierra Madres and west down the river, eating its way up into each of the side drainages on its way down the canyon. View looking down from Sweetwater ridge to the area where the fire is now moving. Now past containment lines, it will be difficult to control its progress down the Sisquoc. With the fire rapidly approaching the South Fork, heading up Judell, Logan, Cliff, and Sweetwater canyons and threatening to open a major new front, command moved to hold this off by backfiring off the Sierra Madres and along the Sweetwater ridge. While the burnout on the crest was successful, before the Sweetwater line could be completed, the fire moved past it despite heavy use of air atttack to slow its progress down so hand crews could contain the spread. Currently the fire in the Sisquoc drainage has moved up onto the Hurricane Deck near White Ledge, advanced more than a half mile downstream from South Fork and completely burned over the lower four miles of the Sweetwater ridge. With no good points to anchor another containment line downstream, it appears the fire will burn out as much of the river canyon and north slope of the Deck as it wants. 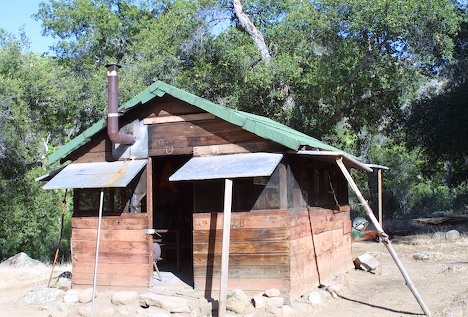 Historic South Fork Station near the Sisquoc River. Archaeologists report that it was wrapped in foil and survived. As a side note, archaeologist Mike Kaberline tells me the the South Fork Station is safe. This photo dates to a volunteer work project several years ago to help repair the Station and the nearby trails.